Ever since 2003, the most talked about subject in early June every year in China has been the National College Entrance Examination. Well, unless there’s a World Cup or European Championship tournament taking place in the same period of time. However, this year, it’s completely different. 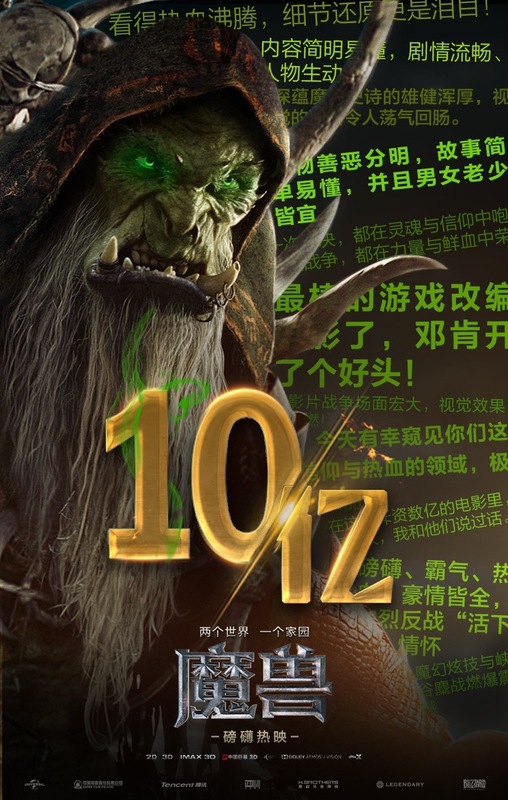 The National College Entrance Examination and the Euros start on June 7 and 10 respectively but despite them, something else has taken the whole country by storm: Warcraft. Whether on the internet or in newspapers, on social media or in real life, people are talking about Warcraft. It’s like if you don’t know about the film, you’re simply out of touch. There’s no denying that in the past few years, Chinese cinema has been enjoying great commercial success. But still, there has never been a film as huge as Warcraft. It has become an unprecedented success and broken many box office records already in just two days after its release. It made $46m on day one. Only Fast & Furious 7 did better than that. And if you take into account the fact that Fast & Furious 7 opened on a Sunday while Warcraft on a mid-week working day, it’s obvious to see that the latter actually made a bigger achievement. Warcraft has an official Weibo (China’s equivalent of Twitter) account and they have posted a series of statistics to show what a sensation the film is in this country, including that 7.55 million tickets were sold in just one day; it earned $5.3m in IMAX in the first day which is the highest for films in IMAX; it reached $91m in box office in two days, the highest for any films in China for the first two days of release. There will be a lot more statistics and records breaking news rolling in and although it’s still early days, many people are predicting the film to be one of the highest grossing foreign films in history. Personally speaking, it’s been a truly exciting few days for me to follow Warcraft’s box office updates. I’ve been a fan of Duncan Jones’ ever since I watched Moon, his debut feature back in 2009. So nothing is more satisfying than seeing Warcraft become such a sweeping success in China. I was concerned about how the public would respond to the film and how it would perform in the domestic market but I knew from Duncan’s previous projects that he was the right man to direct this film and make sure it meets people’s high expectations. In fact there were early signs that this film was going to be a total phenomenon in China. In 2013, Warcraft already topped almost all the ‘Most Anticipated Films’ lists provided by major film websites. Without a doubt it’s a must-see film for every video game player. Since the end of last year, various Warcraft-themed exhibitions have been held in cities throughout the country and attracted countless people. When the film eventually hit cinema on June 8, people were starting to find it difficult to get tickets because most of them had been snapped up in pre-order sales. Long queues are seen in theatres all over the country. In order to attend the mid-night previews, a lot of people even asked for a day off from work. Everyone around me is talking about going to see the film – what’s incredible about that is not many of them have even played the game. Sitting in a packed cinema, I feel genuinely happy for Duncan and the production team, because their years of hard work has paid off. Mtime.com, the biggest movie website in China, did a Duncan Jones feature yesterday, a six-page piece detailing on how he fell in love with filmmaking, the making of Moon and Source Code, his thoughts on Warcraft and the moving stories about him and his father. Over the years there haven’t been many featured articles on directors on Mtime and there definitely weren’t any on, for example, J.J. Abrams, Bryan Singer or the Russo brothers, whose films enjoyed commercial success in China earlier this year. People have started talking about a potential Warcraft sequel and those who have seen Moon are looking forward to Duncan’s next project Mute. Moon was released in 2009 and became a cult favourite in China. I made an effort to spread the word about the film here. Seven years and two great mainstream films later, it’s wonderful for me to find out that this time, when Mute is out, I won’t be the only one to help promoting it, because whether he knows it or not, Duncan Jones has already built a steady Chinese fan base with his films. Thanks, Jessie! WARCRAFT has a lot further to go in box office both in China and the rest of the world having just opened on the 10th June in North America with further regions still to come. According to Box Office Mojo just now the cumulative worldwide total so far is $287,610,000.000. Numbers are great, but even better has been the flood of extremely positive reactions from the audiences around the world. Check Duncan’s Twitter feed for a sample of some he’s been retweeting over the last couple of days. As we started with Gul’dan, we’ll finish with him with a featurette on him and the Orc side of the WARCRAFT story featuring Daniel Wu (Gul’dan, Rob Kazinsky (Orgrim Doomhammer) and Paula Patton (Garona).